Improved understanding of the complex pathophysiology of type 2 diabetes provides a logical basis for target identification and the development of novel glucose-lowering agents. While the major driver of type 2 diabetes is obesity, if β-cells of the pancreatic islets are able to compensate for the obesity-associated insulin resistance by increasing insulin secretion, plasma glucose levels are initially preserved. Once β-cells are unable to maintain this high rate of insulin secretion, hyperglycemia develops. Despite being a relatively late manifestation in the course of insulin resistance, hyperglycemia remains the most important measurements used for the diagnosis and follow-up of patients with type 2 diabetes and to assess treatment response. Ideal biomarkers should be able to detect the early stages of the disease, when insulin resistance is present, but before the development of clinically significant hyperglycemia. 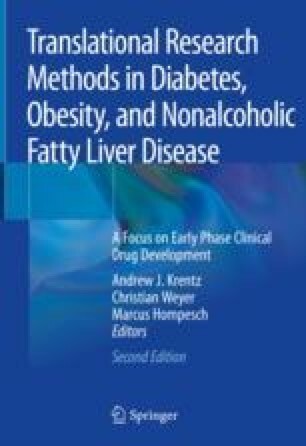 We describe biomarkers related to hyperglycemia and their utility in drug development, as well as biomarkers of insulin resistance, which have the potential to identify early abnormalities in patients with type 2 diabetes and to detect nondiabetic subjects at risk of developing type 2 diabetes. Type 1 diabetes is characterized by severe insulin deficiency that necessitates life-long insulin replacement therapy. We consider the expanding role of continuous glucose monitoring in patients with diabetes. This technology is providing new insights into glucose variability, and it is being increasingly used to inform daily treatment decisions. Moreover, continuous glucose monitoring is also being used to inform the development of novel insulins and other classes of glucose-lowering medications. U.S. Department of Health and Human Services, Food and Drug Administration, (CDER). CfDEaR. Guidance for Industry. Diabetes Mellitus — Evaluating Cardiovascular Risk in New Antidiabetic Therapies to Treat Type 2 Diabetes. 2008. Available at: https://www.fda.gov/downloads/Drugs/.../Guidances/ucm071624.pdf. Last accessed 15 Jan 2018. National Glycohemoglobin Standardization Program. Factors that Interfere with HbA1c Test Results. 2017. Available at: http://www.ngsp.org/factors.asp. Last accessed 15 Jan 2018. European Medicines Agency. Guideline on clinical investigation of medicinal products in the treatment or prevention of diabetes mellitus. 2012. Available at: http://www.ema.europa.eu/docs/en_GB/document_library/Scientific_guideline/2012/06/WC500129256.pdf. Last accessed 10 Mar 2018.